Bedknobs and Broomsticks (film) In the autumn of 1940, an eccentric, ladylike spinster, Eglantine Price, becomes an apprentice witch, in hopes of finding a magic formula which will help England win the war against Nazi Germany. With the help of three London children, who she takes in to save them from the blitz, she first seeks out her amusing but bogus professor of witchcraft, Emelius Browne, and then ventures into Portobello Road in search of the rare formula. Miss Price finally discovers that the words of the magical spell can be found on the legendary “Lost Isle of Naboombu,” so she, Browne, and the children travel there, having adventures beneath the sea along the way. They discover the lion king of Naboombu is wearing a medallion with the words to the spell on it, which they have to obtain. All of this magical travel is possible with the aid of a magical bedknob. Returning home, Miss Price uses the formula to raise a ghostly army of armor from the local museum that routs a band of invading German commandos. Premiered in England on October 7, 1971; U.S. general release on December 13, 1971. Directed by Robert Stevenson. 117 min. for the original release version; whittled down to 98 min. for a 1979 reissue. Stars Angela Lansbury (Eglantine Price), Roddy McDowall (Mr. Jelk), David Tomlinson (Emelius Browne), Sam Jaffe (Bookman), John Ericson (Col. Heller), Bruce Forsyth (Swinburne), Tessie O’Shea (Mrs. Hobday), Reginald Owen (Gen. Teagler), Ian Weighill (Charlie), Roy Snart (Paul), Cindy O’Callaghan (Carrie). 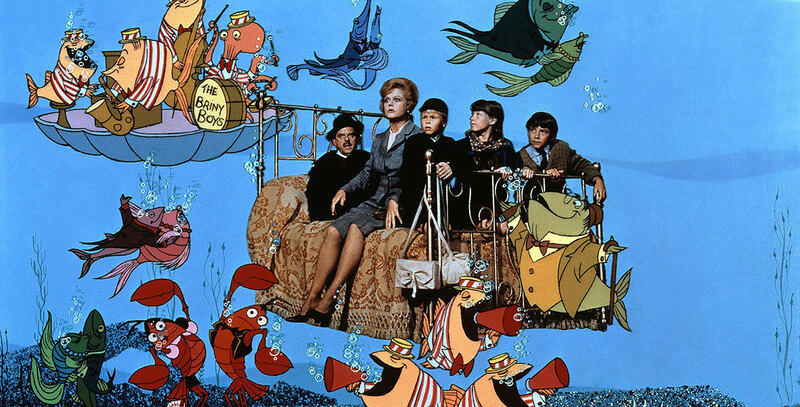 The creative talent behind Mary Poppins joined forces again for this film, including producer-writer Bill Walsh, director Robert Stevenson, songwriters Richard M. Sherman and Robert B. Sherman, music supervisor Irwin Kostal, art director Peter Ellenshaw, and special effects technician Eustace Lycett. The songs included: “The Old Home Guard,” “Eglantine,” “The Age of Not Believing,” “Portobello Road,” “The Beautiful Briny,” and “Substitutiary Locomotion.” One song sung by Angela Lansbury on the sound track record album, “A Step in the Right Direction,” was edited out of the film just before its release. The screenplay was based on Mary Norton’s book, with additions by Bill Walsh, who came up with the German invasion. The film was made entirely on the Disney Studio lot in Burbank, California, where outdoor sets included the town of Pepperinge Eye and Miss Price’s seaview cottage, and indoor sets including a three-block section of London’s legendary Portobello Road. Two hundred players jammed this set alone, which was filled with bric-a-brac and such oddments as a Sicilian sedan chair, Limoges china, and gas masks from World War II. Among the performers and extras in the crowd were veterans of music halls, vaudeville, rep shows, radio, silent films, and early talkies. The ghostly medieval army’s weapons and armor had originally been assembled in Spain for the film El Cid, and then were shipped to America to be used in the Warner Bros. musical Camelot. Ward Kimball was the director of the wonderful animation sequences on the Isle of Naboombu. Despite the effort, lavish budget, ingenuity, and special effects, the film was not a great box office success, causing the studio subsequently to edit the film. The editing was accomplished primarily to the detriment of musical numbers—large chunks of “Eglantine” and “With A Flair” were deleted. Academy Award winner for Best Special Visual Effects. The movie was nominated also for Best Art Direction/Set Direction, Best Song (“The Age of Not Believing”), Best Scoring, and Best Costume Design. The film remains a Disney favorite today, with a theatrical reissue in 1979 and releases on video in 1980, 1985, and 1989.